Please note – these are basic instructions and do not represent the full extent of the technique. If you work with me, I will guide you through the technique and teach you much more than I can show you here. To use EFT all you have to do is tune in to how you are feeling. In the instructions I use an example of feeling stressed – something most people will be able to relate to. 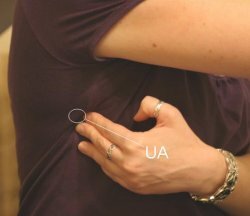 First notice where in your body you feel that stress. Now score that stressed feeling on a scale of 0 – 10 where 0 is no stress and 10 is maximum stress! Then we use that feeling to get in touch with the problem – this is called the Setup. 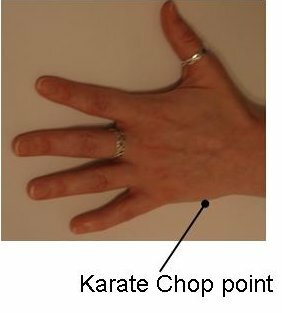 Repeat this 3 times out loud, whilst tapping on your karate chop point (see diagram below). Now, check your score again. It is likely to be lower. The tension in your stomach may have eased a bit or you might now have a different feeling e.g. a tightness in your jaw. Tune in to that new feeling and give it a score. Then either repeat what you started with or change it to reflect your new feelings. E.g. “Even though I’m still really stressed about my work deadline and I feel a tightness in my jaw, I completely accept myself anyway”.” Repeat the setup statement 3 times whilst tapping your karate chop. Then repeat your reminder phrase (“I’m still really stressed about my work deadline and I have a tightness in my jaw”) as you tap about 7 times on all the other points. Keep repeating this until your score gets to 0. You may have to do several rounds and keep changing the words as your feelings change. Imagine that your problem is like a jigsaw puzzle. You need to work on each piece of the jigsaw puzzle (aspect) until all the pieces have been dealt with. Being very specific and persistent is the key. This is an important part – you need to test your results. Vividly imagine the problem and note how you feel about it. If you still feel something then you have more tapping to do! If you can’t feel anything about your problem then you’re probably done. The real test comes when you face your problem e.g. you reach your work deadline. If there is some feeling that comes up when you test for real, then you again have more tapping to do. You might not have addressed all of the aspects. You may start to feel more relaxed, calmer and you may notice tension leaving your body. Many people yawn or sigh – this is a good sign of energy shifting. Just observe the changes you experience. Drink plenty of water and rest if you feel you need to. If you are stuck and need some help please Contact me. 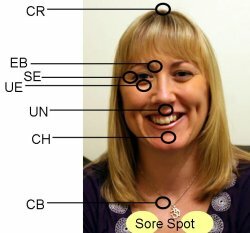 I teach my clients how to tap during our first EFT session. From then on you will know how to tap and what to do when you get stuck. I also offer my clients free support in between their sessions via email. I will send you hints, tips and encourage you to do homework so that you get the maximum out of our work together. You can also download my free eBook “6 Tips to Overcome Blocks Using EFT” if you sign-up to my newsletter. What are waiting for?